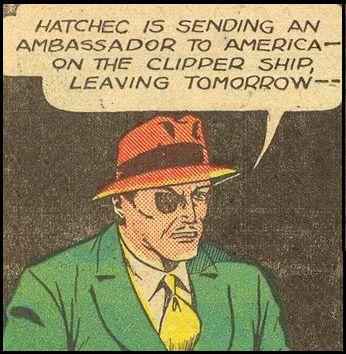 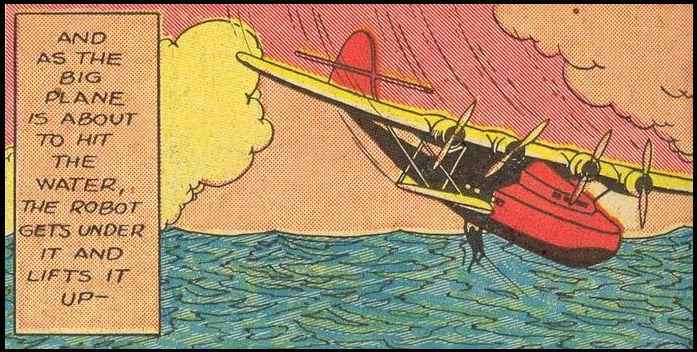 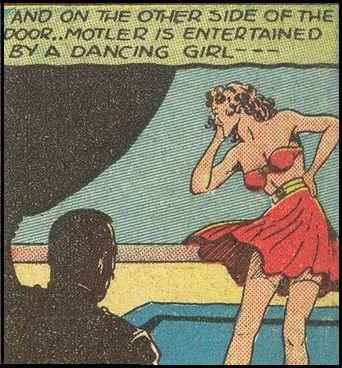 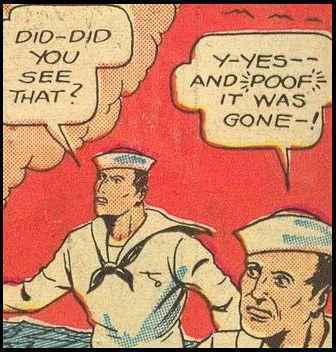 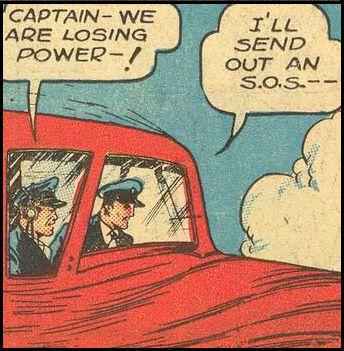 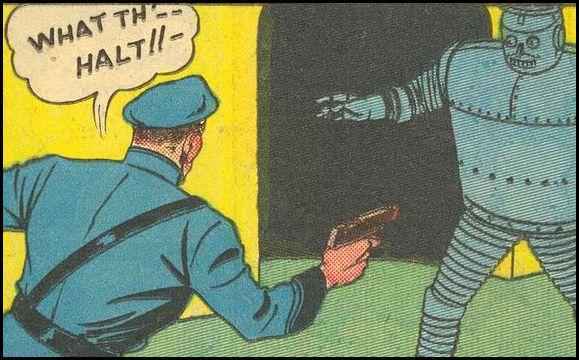 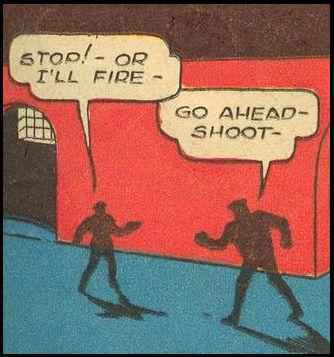 The pioneering periodical producer Quality Comics (Smash Comics, National Comics, Uncle Sam, Police Comics, Plastic Man, etc. 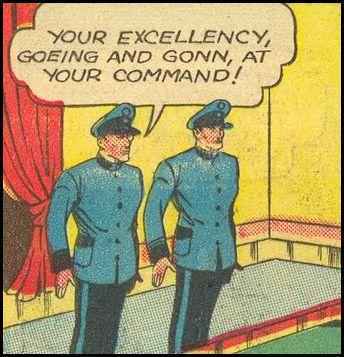 ), published by Everett M. "Busy" Arnold, was edited by GA great George Brenner. 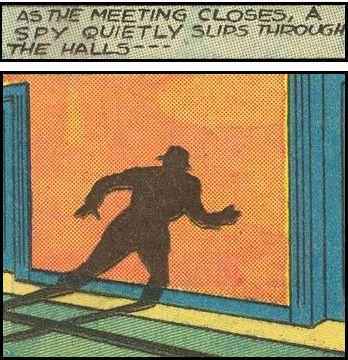 Brenners accomplishments include his creation 'Alias the Clock', the first masked hero in comics and an inspiration for Will Eisner's 'The Spirit.' 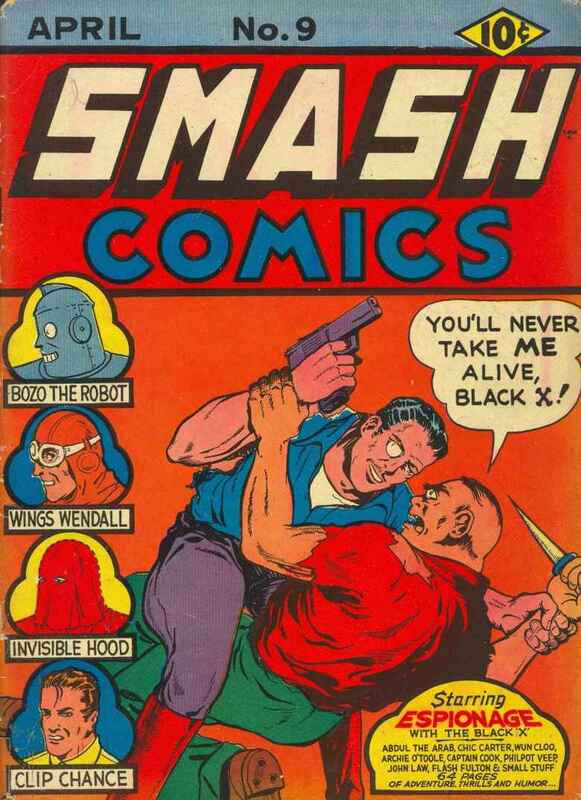 Under the pseudonym Wayne Reid, he created, scripted and rendered the art for Smash Comics' 'Hugh Hazzard and his Iron Man,' a precursor of Stan Lee's Iron Man (as well as the stylistic inspiration for the modern character 'Concrete'), which ran in Smash Comics #1-42. 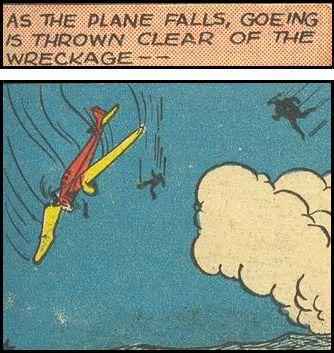 Toonopedia is an awesome resource, but I think they very probably have this one wrong. 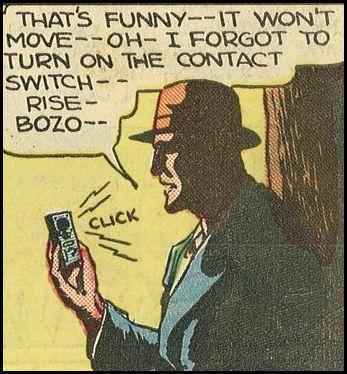 Published from 1939 to 1943 in Quality's Smash Comics (hardly an 'obscure' title), the extremely distinctive image of Bozo was on about every fifth cover; incredibly hard to miss. 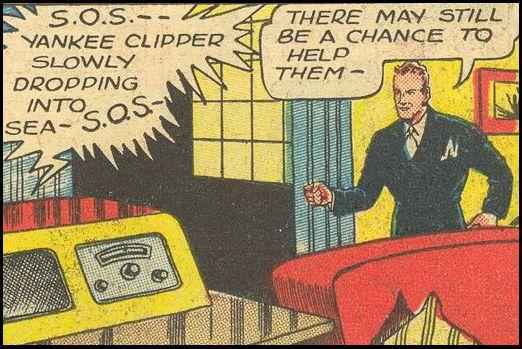 Young Stan Lee, working for Timely by at least early 1941 that I know of (probably earlier), would surely have perused the competitions' product with a degree of concentration superior to an 'average' comic reader. 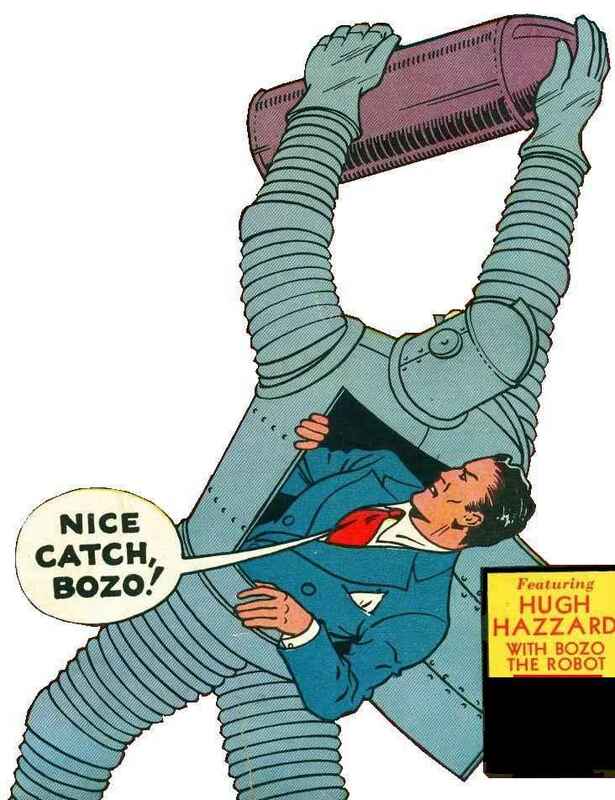 Though I would not go so far as to call Lee's Iron Man a 'copy' of Bozo, the odds that he never read a 'Hugh Hazzard and his Iron Man' story are really quite small. 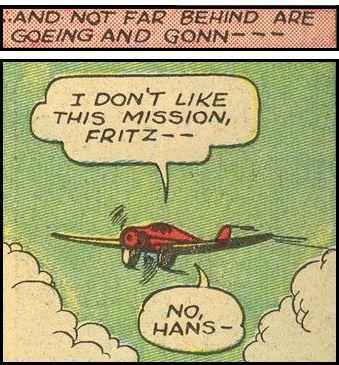 I wonder if Stan ever commented about the similarity between two characters? 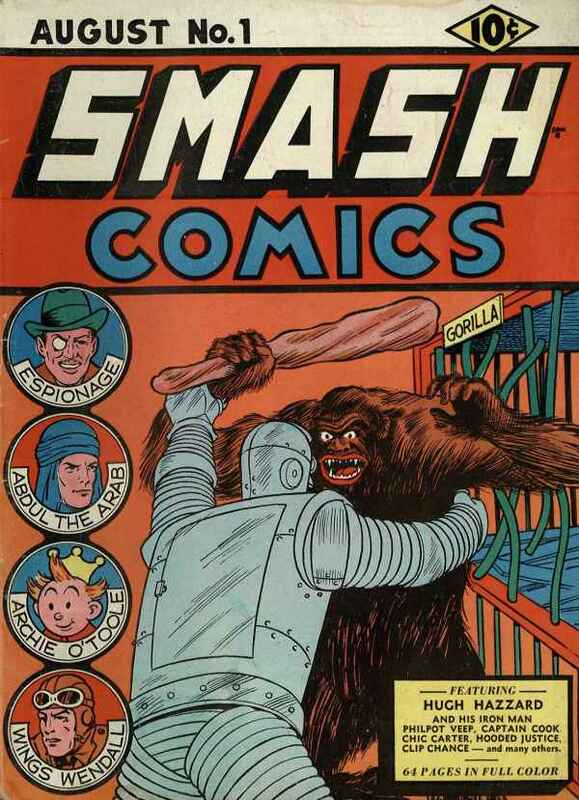 The other claim that appears questionable is that the Bozo cover for Smash Comics # 1 is credited (by Overstreet) as the first appearance of a 'robot' on a comic book cover. 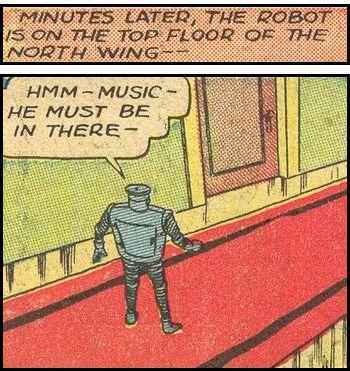 To paraphrase Bill Clinton: that depends on what your definition of 'robot' is. 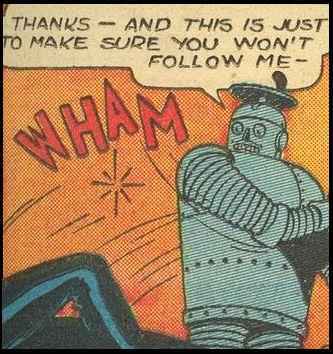 The idea of a robot, at least as Asimov (an authority on the subject) famously concieved one to be, goes beyond the idea of a remote-controlled mechanical man (which is all Iron Man's armor operated from a distance would be) and incorporates the concept of an autonomous entity; a self-aware consciousness generated electronically/mechanically. 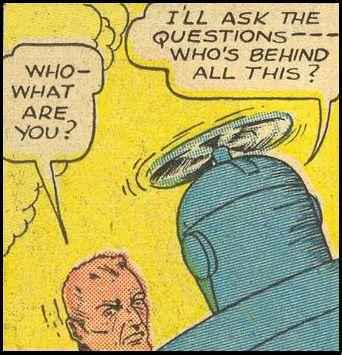 (A mechanical man with a human brain would be termed a cyborg.) 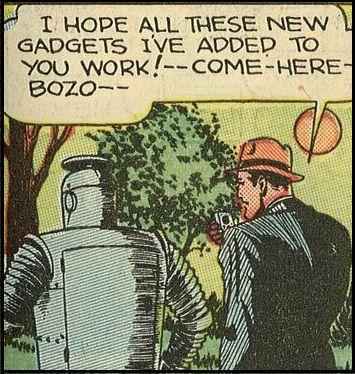 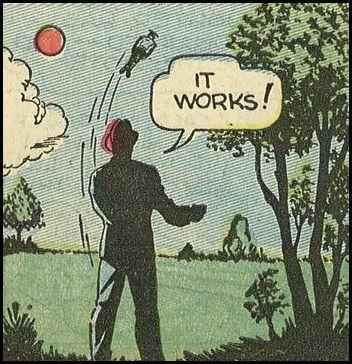 Since Bozo never had a mechanical (or any other kind of) brain, he was not, strictly speaking, a robot at any time in his run. 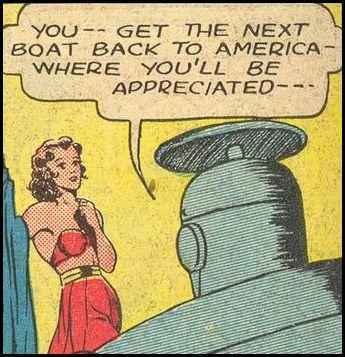 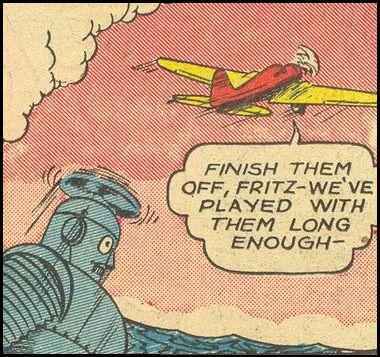 Therefore, the first appearance of an actual robot on a comic book cover has yet to be correctly documented. 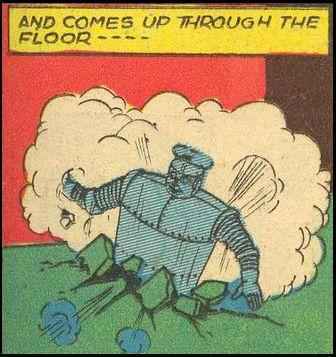 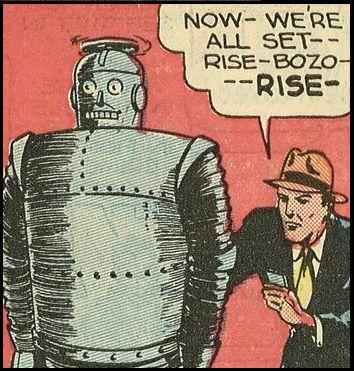 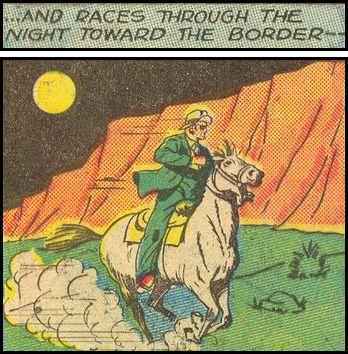 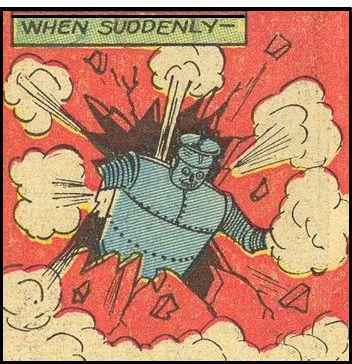 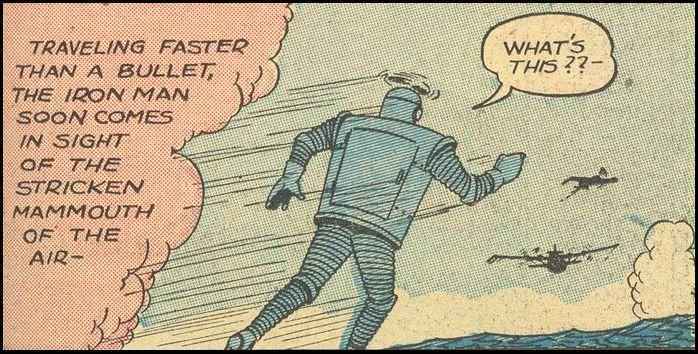 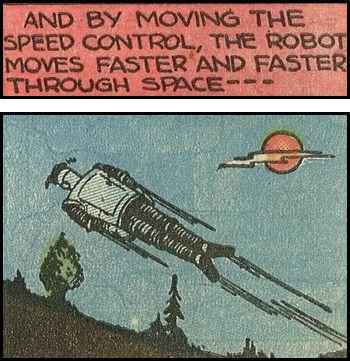 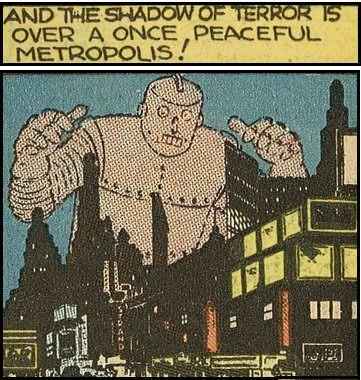 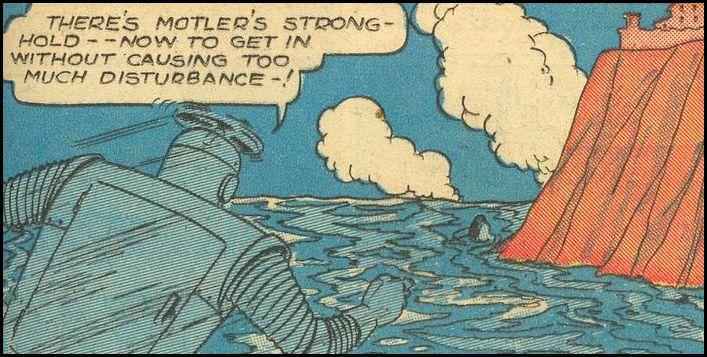 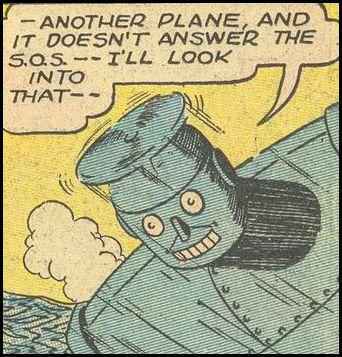 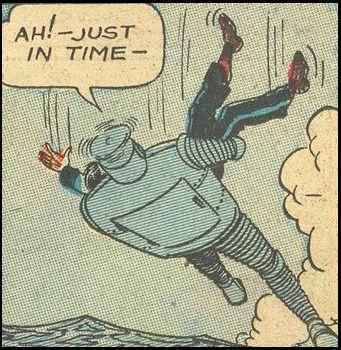 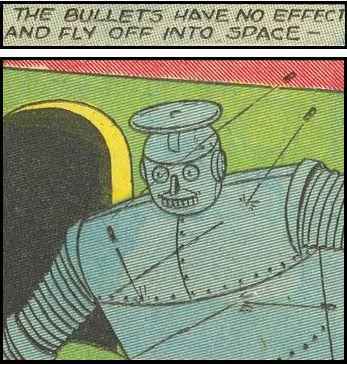 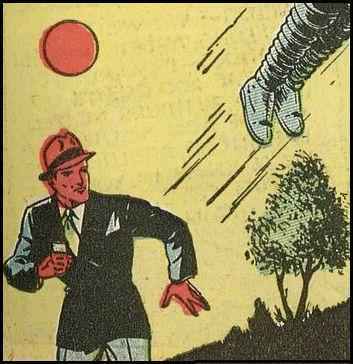 In Bozo's origin story in Smash Comics #1, an unstoppable, initially unnamed metal man is terrorizing a 'once peaceful metropolis.' 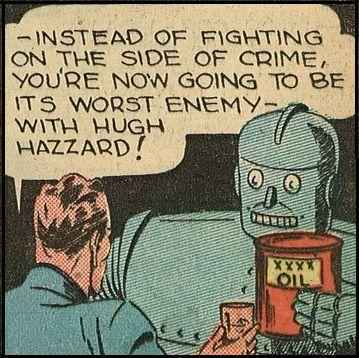 After repeated failures to deal with the menace, Police Commissioner Hunt summons Hugh Hazzard: "If anyone can solve this case, it's he!" 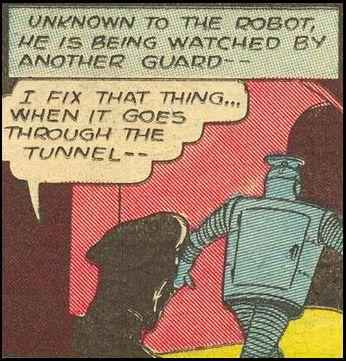 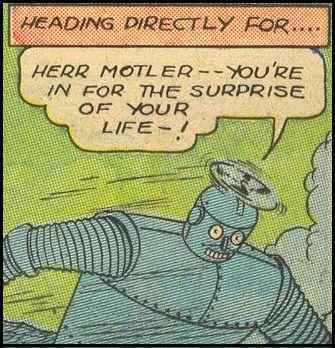 Eventually, Hazard manages to disable the metal man long enough to crawl inside, where he hides until he arrives at the hideout of von Thorpe, the 'Mad Inventor.' 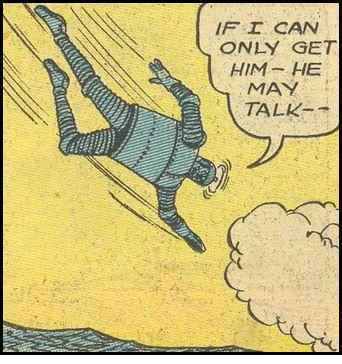 The miscreant is soon over-powered. 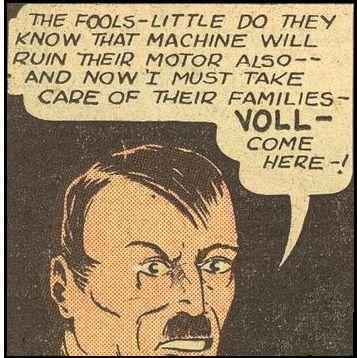 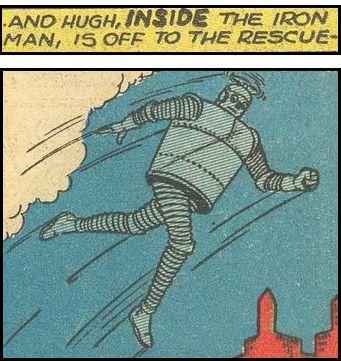 The (presumably) German inventor of the Iron Man is 'believed insane due to great need of funds?' 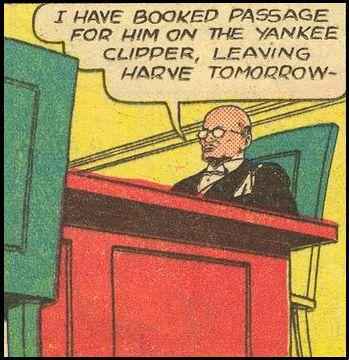 One wonders how such an argument would play to a jury? 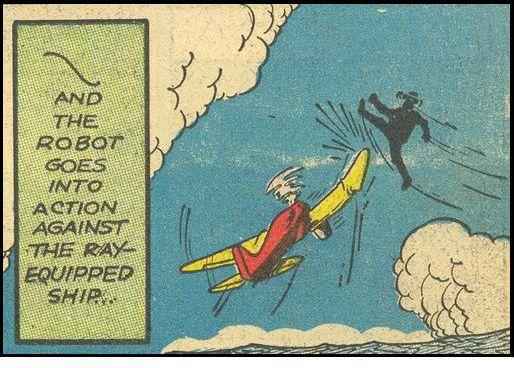 One can only presume that repulsor rays are next? 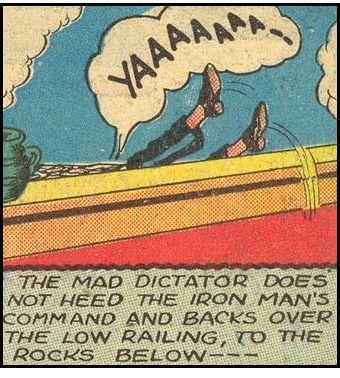 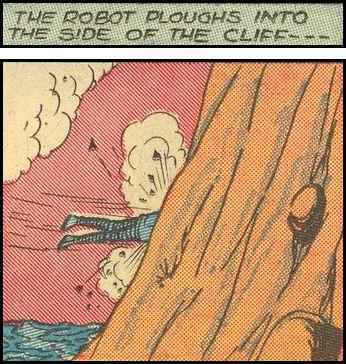 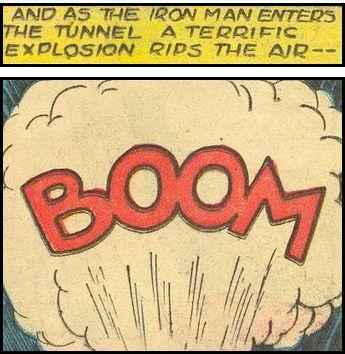 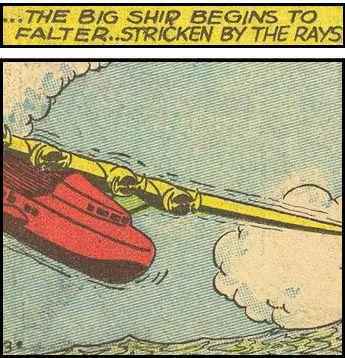 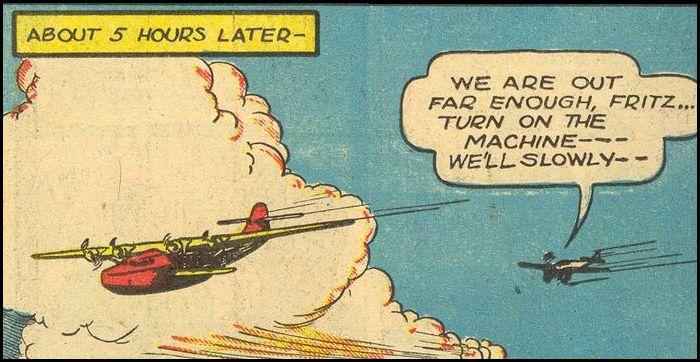 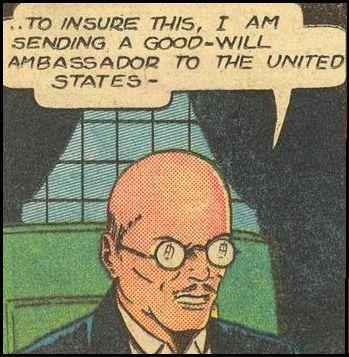 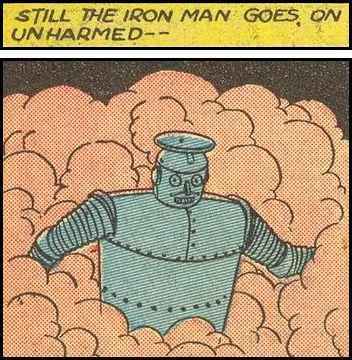 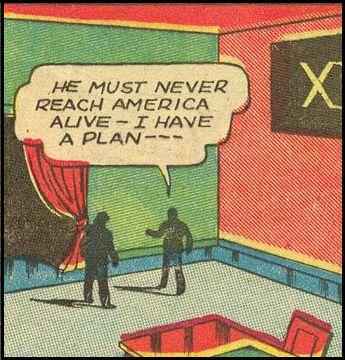 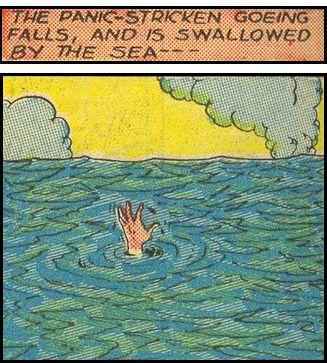 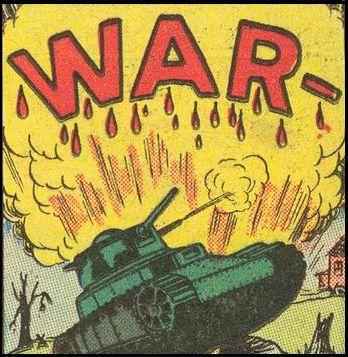 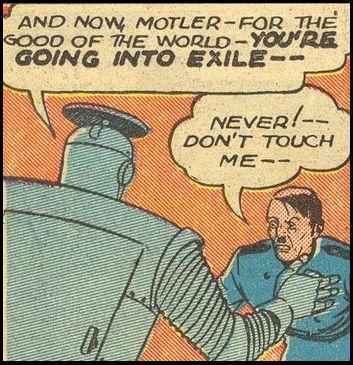 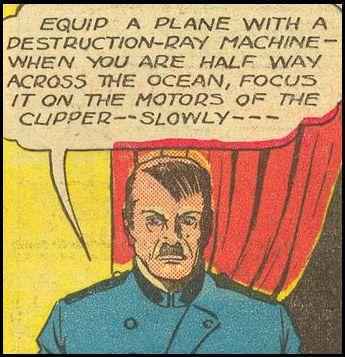 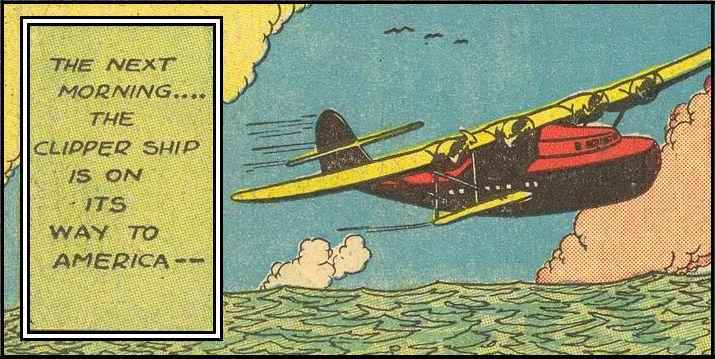 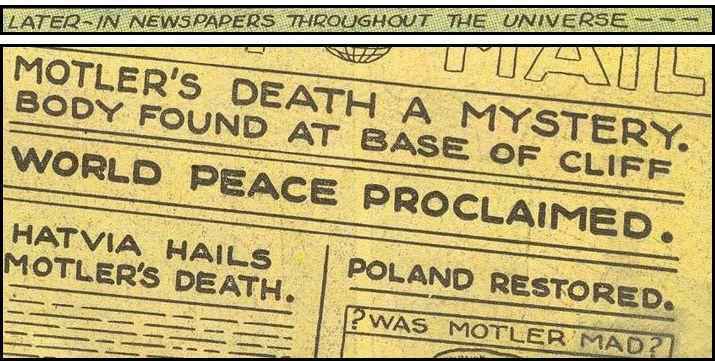 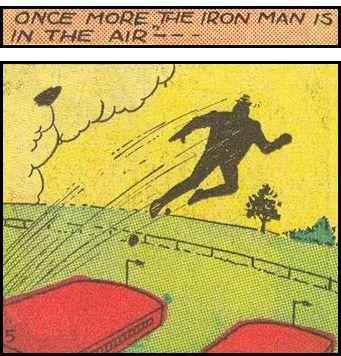 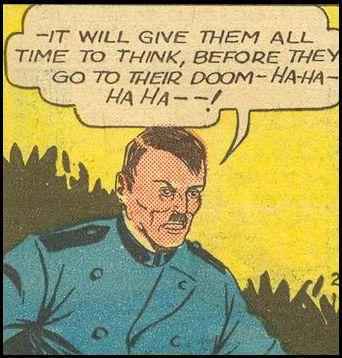 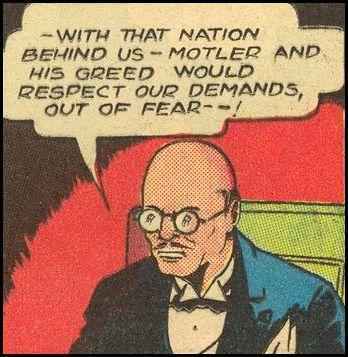 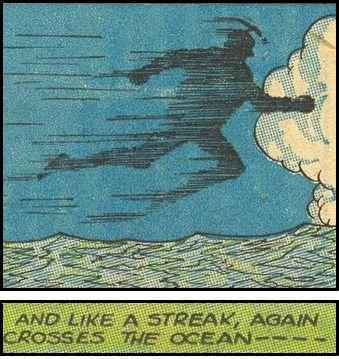 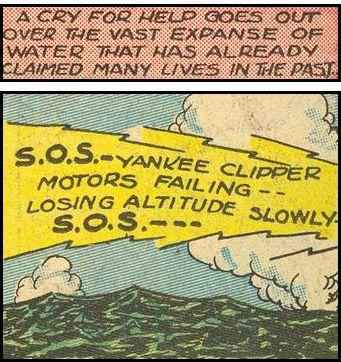 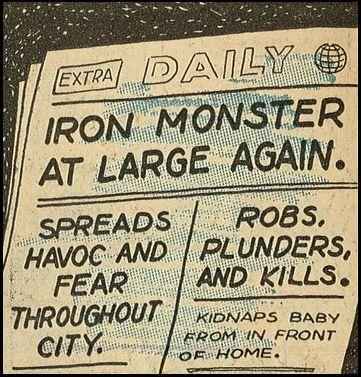 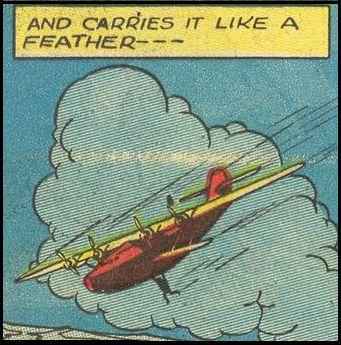 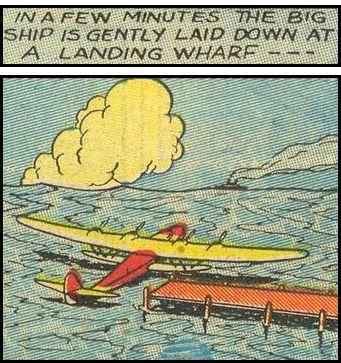 Below is the entire April 1940 Iron Man story from Smash Comics #9. 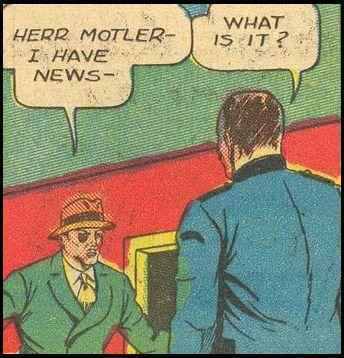 George Brenner, editor, writer, artist, displays a real talent for satirical humor. 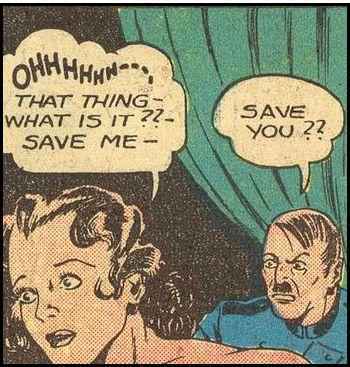 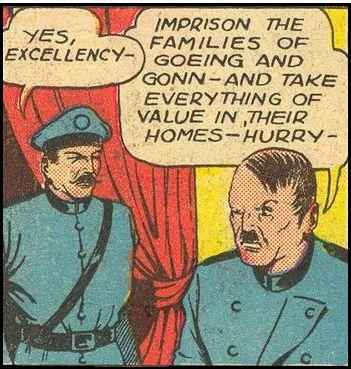 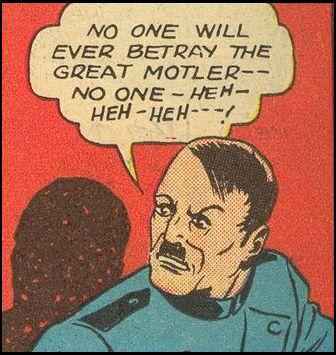 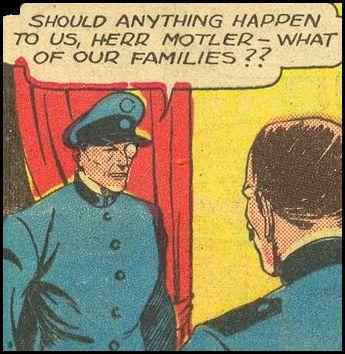 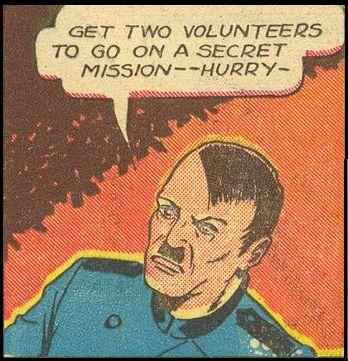 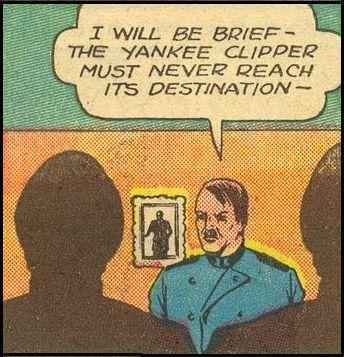 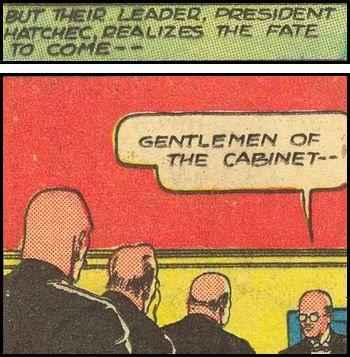 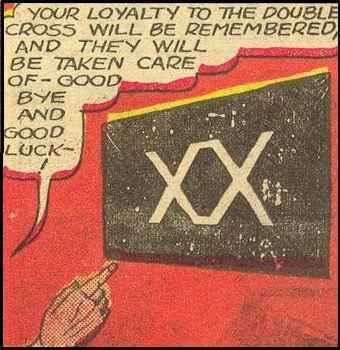 The names of the fake Hitler's henchmen, and the whole 'loyalty to the Double Cross' routine, are priceless. 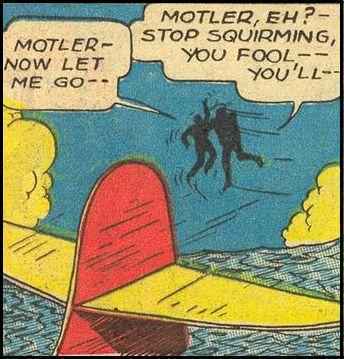 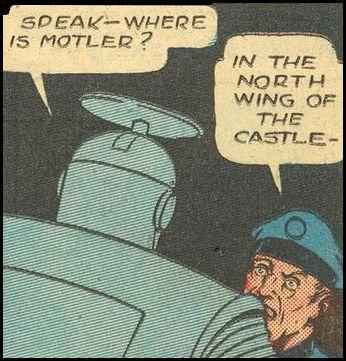 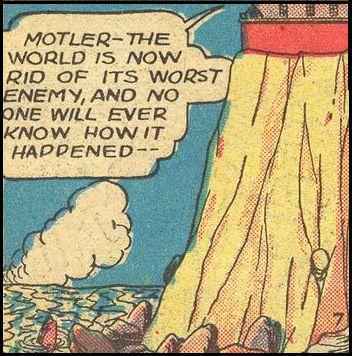 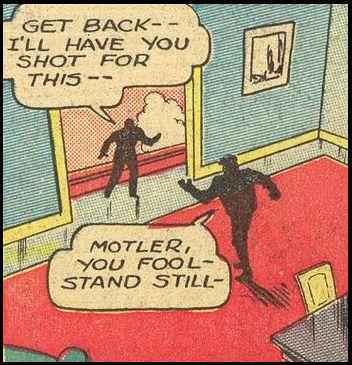 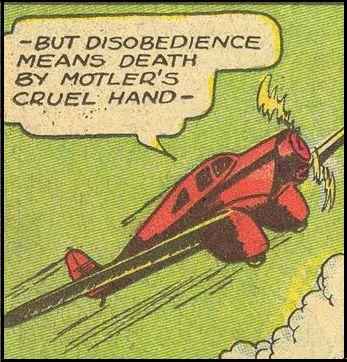 Note how Motler typically has absolutely no redeeming qualities whatsoever, and is done in by his own fear-fueled panic. 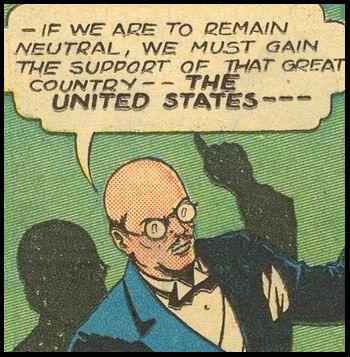 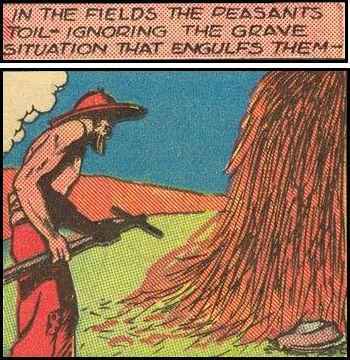 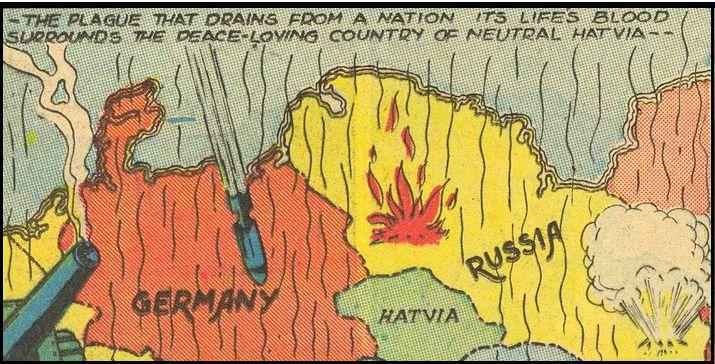 The 'final thought' at the bottom of the last panel corresponds to a popular (and still prevalent) belief in the US.